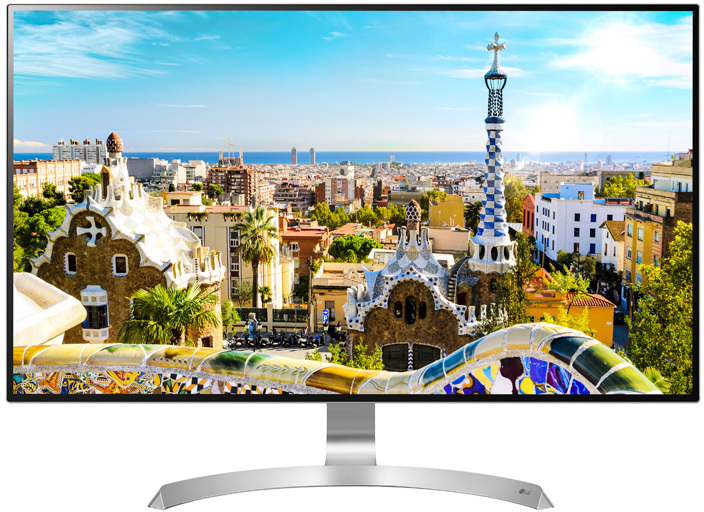 LG's new 32UD99 display is now available to order for $999 from retailers such as Amazon and B&H Photo Video, as noted by AnandTech. The 31.5-inch IPS LED display features Ultra HD resolution of 3,840×2,160 pixels, which is often marketed as 4K, support for 95% of the DCI-P3 wide color gamut, and a USB-C input for single-cable connectivity with a 12-inch MacBook or 2016 MacBook Pro. It also supports HDR10 and AMD FreeSync. LG's 32UD99 arguably looks nicer than the UltraFine 5K, while its larger screen, HDR10, and AMD FreeSync support are attractive features for gamers. But, for $300 less, you are getting Ultra HD resolution instead of 5K, USB-C instead of Thunderbolt 3, no webcam, lower power delivery, and slightly less coverage of the P3 color gamut. Read our Thunderbolt 3 and USB-C Display Buyer's Guide for other options. Now THAT is a good looking display. Makes you wonder why the Apple / LG 5K display didn't use a similar design. LG has been shipping displays with this design for a while now. Edit: the 4K one looks reasonable now with additional HDMI and DisplayPort connectors. a bit pricy to get that P3 color space and USB-C support. They should have lead with this instead of the USB-C only model. 4K at 32" kind of defeats the purpose though of a Retina display. LG has a nice refreshed 27ud69 that's probably better for most needs. Not as many highend checkboxes but half the price. Looks nice, but not true 4K. "True" 4K at 4096 wide is really only for video production and pro work. They charge like twice again for those panels with high-end color specs. They have very low volume. Yay market separation! 3890 wide is the "consumer" 4K UltraHD spec that matches TVs and broadcast standards. To push customers towards Apples own display(s). But, Apple doesn't have a display. At least, not yet, and probably not for two years if you believe the rumors. I guess you could be right, maybe it was deliberate to remind Mac consumers on how nice Apple's displays are. This does look leaps and bounds better than that other abomination. I'd buy one if my MacBook Pro supported 60Hz 4K. Ya — personally referring to the modular Mac Pro. I figured you were, as it is easy to forget that there is currently a "New" Mac Pro. But the OP was not clear on what Mac Pro the post was referring to, I am pretty sure the post was referring to the current 2017 "new" one. I think there is some confusion here. The new 2017 Mac Pro, which is basically the 2013 Mac Pro, does NOT have Thunderbolt 3. It has 6 Thunderbolt 2 ports. I am unsure if this display will work on the current Mac Pro, probably not. Anyone, please correct me if I am wrong about this. If carlsson was referring to the rumored Mac Pro that might be out in two years, then yes, I would hope it would have Thunderbolt 3. It is ridiculous that the 2017 "New" Mac Pro doesn't have TB3. Waiting for a 4K/5K ultrawide personally. And non 4K 30" displays are almost double of that.